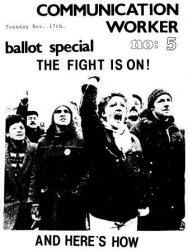 A special bulletin of the rank and file Communication Workers Group's newsletter covering a strike ballot for a shorter working week, from 17 November 1988. This is definitely from 1988. If you or anyone else has more back issues of this we would love to get them online, so please get in touch if you do!